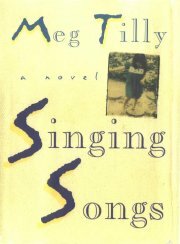 This page is to introduce you to one of Meg's finer accomplishments - her novel called "Singing Songs". Originally released in 1994, Meg has issued a re-release of her book with a new cover photo. When Meg left home to explore a dancing career, she only brought a few items with her. One of those items was a picture of her sister, Becky, and it's that picture that now graces the cover of the re-release of "Singing Songs". I admit that as a Meg fan, I'll probably like anything she does. But, I truly did enjoy "Singing Songs". And, the people I've recommended it to have liked it as well. The main thing to remember while reading it is that the story is told from the viewpoint of Anna, who is only 4 years old at the beginning of the story. I've taken the liberty of sharing one chapter with you at the bottom of this page. I don't want to tell the whole story here - I'd rather you read it yourself! But, in a nutshell, "Singing Songs" is the story of a Nomadic family seen through the eyes of a child. The story can be disturbing at times, funny, and endearing. Meg has a unique style of writing, and it is very easy to follow and understand. When "Singing Songs" was originally released, people who know something about Meg's personal background felt this story may be somewhat biographical. I found myself thinking the same thing. However, Meg originally denied this whenever she was asked this question. But, after much soul-searching and showing a tremendous amount of courage, Meg has confirmed that both "Singing Songs" and her new novel "Gemma" are both based on events that did happen to her and her siblings in their childhood. somebody new. And the strange thing is, how it happened so fast. "Bye-bye!" she says, waving out of the window. "Bye-bye!" gangly limbs connected by lumpy joints. Hair toast-colored and straggly. us off, but we won't let go. to meet Nick, Faith, and Joy, your new brother and sisters!" "The are going to live with us now," says the new daddy. "Where are your suitcases?" asks Matthew. "Don't you have any clothes?" faced. And Joy the littlest one looks like she's gonna cry. "Give each other a hug and kiss," says the new daddy. So, we do. Arms out stiffly from our sides, careful not to touch bodies. careful. Company voices. Aching tummies. the twin, swings around on him, eyes narrow, fists clenched. mouth drops right open, cause he was just trying to be friendly. And from that moment on Faith had it in for him. be glad it wasn't me she hated. and piss all over it too. Please read "Singing Songs". It is very good and easy to read. Thanks!